Marc Fontaine has been Airbus’ Digital Transformation Officer (DTO) since 1 May 2016. In this role, Marc is responsible for the company’s digital transformation and for leading the deployment of digital technologies across Airbus and its Divisions. Given the major impact that digital technologies are expected to have on the aerospace industry in the coming years, Marc’s role as DTO puts him in the driver’s seat of one of the company’s most strategic challenges. As Airbus’ DTO, he is equally responsible for the company’s Corporate Information Management and Security Departments whose task is to ensure efficient operations and the security of company products, people and assets. Marc began his career at Airbus and its predecessor companies in 1998, working in various roles in mergers and acquisitions, strategy and business development. In 2002, he became the CEO of Istar, a digital technology company, before joining Airbus Helicopters in 2004 as the CEO’s Chief of Staff and Company Secretary. 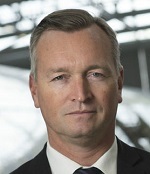 From 2007 to 2016, Marc held various executive positions, including as the Chief of Staff to the Chief Executive Officer (CEO), the Company Secretary of Airbus’ Commercial Aircraft Division; also serving as a member of Airbus’ Executive Committee. Marc graduated with a degree in business from the EDHEC School of Management in Lille, France, and holds an MBA from Aston Business School in the UK. He has set up a few small ventures in publishing and apps development.